Melt butter. Mix the durian and ricotta cheese well. Set aside. Whisk eggs vigorously for 30 seconds. Add milk, water, melted butter, flour, salt, and sugar - whisking to blend well after each item is added. Let sit for an hour or more (for flavors to absorb). This step can be done ahead of cooking. The batter can be stored in refrigerator for up to 1 day, just make sure to bring to room temperature and strain any lumps before cooking. Spray a non-stick pan with a little cooking spray or oil, heat it up over medium heat. Pour a little batter in and swirl evenly. The goal is to make a very thin crepe. 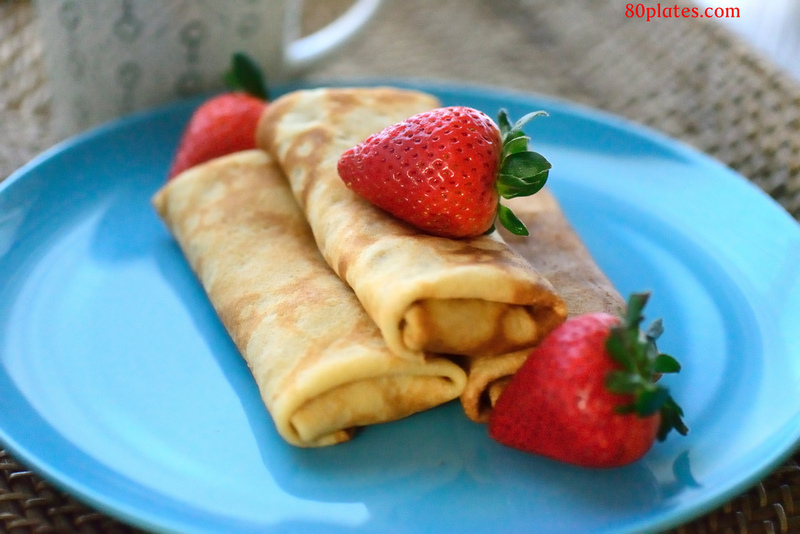 When the edges curl up crisply, flip it with a spatula, be careful not to break the crepe. Cook for another 30 seconds. Remove from heat and let rest, keeping the crepe flat. Repeat this step until you have no more batter (should yield ~10-12 crepes).